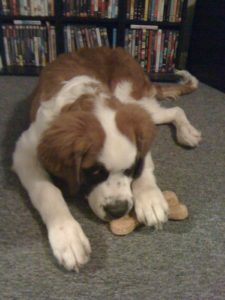 How Delicious Are Our Dog Treats? The Pictures Speak For Themselves! 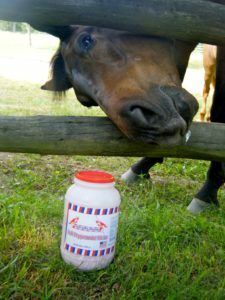 It’s the question that you can be sure someone will ask when you mention that dog treats are delicious: “And how do you know? Have you tried them? !” I’ll start by saying the temptation was great to – pardon the pun – double dog dare a coworker to do just that! But I resisted temptation when a handful of paw-dorable pictures came my way. A friend of mine recently became the proud puppy papa to a furry bundle of love named Sully. While I would typically celebrate a new baby’s arrival with a gift of Bubble Gum Cigars, I knew those weren’t going to cut it for Sully. He needed some tempting bone-shaped treats, and he needed them to be our Mega Bone Dog Treats. 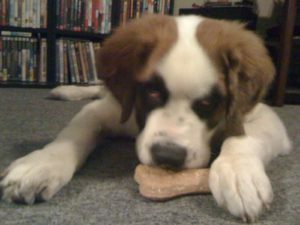 After all, he’s not just any puppy; he’s a Saint Bernard puppy. And they only come in one size…huge! Our Mega Bone treats are an all natural doggy delicacy handmade with yummy peanut butter. And at just $3.50 per bow-wrapped bone, they’re a good-for-your-dog treat that doesn’t break the bank. If your pooch isn’t quite ready to tackle such a treat, we have smaller Natural Dog Treats as well. 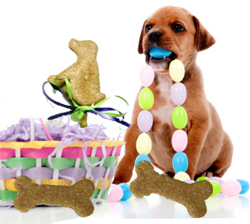 Many of the dog treats we sell, including the bone above, are from Barbara’s Canine Catering, Inc. 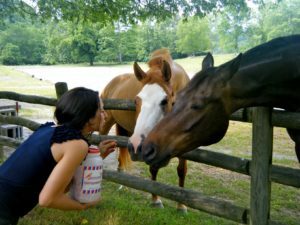 If that name sounds familiar, you may have seen them featured on Good Morning America, Animal Planet, or within the pages of several popular magazines. And if you think for a second that Barbara’s canine credentials will go unappreciated by your pup, think again. A dog’s eyes never lie; particularly those of a plush and perfect puppy. And Sully looks mighty pleased with what Barbara has whipped up in her canine kitchen!